Most modern combat maneuver battalions must have a scout company. Its mission is to detect and engage enemy forces to determine their strength, and to destroy enemy reconnaissance elements. Extended flank security is more important since lightweight long-range anti-tank systems now allow tank snipers and small helicopters to destroy ultra-expensive armored vehicles from afar. Since the modern world is covered with roads, a simple light truck is the best platform for this mission, as explained here: Scout Trucks The basic jeep performed this task during World War II and can do so today. However, the diesel powered Toyota Hilux (similar to the Tacoma) is common throughout the world and can be acquired and maintained at a far lower cost. The value of light commercial trucks as crew weapon transports arose in poor Africa, and became known as "technicals." A great variety of weaponry is mounted that threatens expensive helicopters and APCs. This simplicity allows better weaponry by skimping on the cost of the platform. This has been adopted in several modern armies who now purchase cheap commercial vehicles for military use. This would be an abrupt change for big spending organizations like the US Army. The HMMWV was introduced two decades ago as the replacement for the jeep, costing three times more. This is a decent vehicle, but was criticized in recent occupations since it was not designed to minimize damage from land mines and off-road mines (now called IEDs). As a result, the increasing dysfunctional Pentagon bureaucracy has begun to purchase a new light truck known as the Joint Light Tactical Vehicle JLTV for a $1 million each! This may not seem outrageous to Generals who recently purchased Stryker IAVs for $4.6 million each. In addition, the JLTV burns four times more fuel than a Toyota and breaks down far more often. Armies must abandon efforts to build custom trucks and focus on simple modifications to proven commercial trucks made cheaply with mass production. A notional scout company would have around 150 soldiers mounted on 55 light trucks. It does not have platoons, but 11 independent squads each with five light trucks like the proven Toyota Hilux. 1. Point Truck - This truck has no weapons mounted to retain "local" stealth and blend in with civilian clutter so they are ignored by enemy UAVs and aircraft. This also allows for added weight in the form of Kevlar flooring to help protect against mines. It may have mine or IED jamming equipment. It should have a bulletproof windshield while the observer employs binoculars and an infrared viewer. This should be a hybrid Toyota with a large supplemental battery to allow for extended driving on electric power, allowing it to move silently at night or in fog with no engine noise or IR signature. The hybrid engine also allows it to escape on electric power if its engine is shot up. These will have just a driver and often an observer since it fills the dangerous "on point" role of boldly driving alone ahead of others. They hope to see the enemy first, or hope their non-threatening common truck will not be fired upon since an enemy is unsure if it's hostile and not worth wasting an expensive guided missile. The truck may have an instant smoke dispensing system to help escape trouble, and perhaps two bumper mounts for claymore mines that can be fired should close-in trouble suddenly appear. 2. Expendable Truck - This is a basic truck that carries extra supplies for the squad. It is driven by the observer who sometimes rides in the point truck. This occurs when an enemy is close or where land mines or IEDs are expected. In such cases, he drives ahead of the point truck and turns on the expendable truck's remote control. Then he rides in the point truck that follows from where he drives his truck remotely with the help of a dash cam. If the truck is ambushed or blown up, no one got hurt as the expendable truck proves its value. 3. 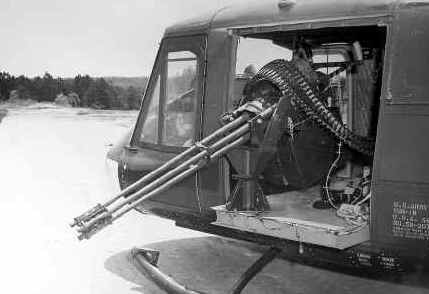 Gun Truck - The best light multi-role weapon is probably the General Dynamics M197 20mm gatling gun that has been used by US Marine Corps helicopters since the Vietnam War (pictured) with long range and IR sights. This is a lighter (three-barrel) version with less recoil than the faster firing M61 Vulcan. Installing basic outriggers for stability while firing is a good idea. For unknown reasons it has never been mounted on ground vehicles. Some may assume this weapon plus ammo is too heavy for a light truck. But the gun itself weighs just 132 lbs. 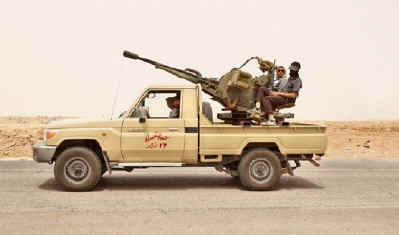 Insurgents in Chad operate a 2100 lb 23mm Russian AAA gun from the bed of a Toyota (pictured), so the M197 should be no problem. This weapon is ideal for scouts who need long-range instant firepower when they suddenly encounter an enemy. It can slice through APCs, helicopters, and UAVs 2000 meters away. 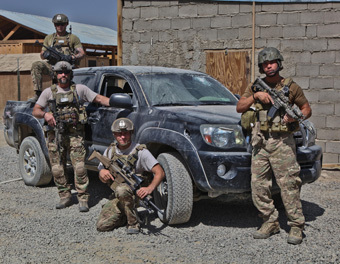 The four soldiers in this truck may also employ a basic .338 (8.6mm) machine gun. 4. Recon Truck - This basic truck carries a four-man recon team used for foot recon or skirmishes with enemy recon units. 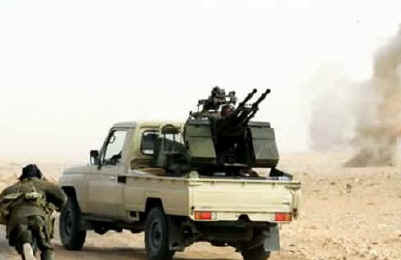 The truck mounts a .338 (8.6mm) machine gun and carries two .338 sniper rifles. The Point truck may often halt and ask this team to dismount to check a ridge or building or anything ahead that arouses suspicion. 5. Comm Truck - No weapons are mounted because this is also an observation truck and a machine gun would shake the cab and disrupt its optical system and communications. In addition, this vehicle coordinates air and artillery fire so does not want to draw enemy fire. The truck has a driver, observer/fire support coordinator with a telescoping mast, a medic, and the squad leader. This team also has small, cheap COTS quadrotor UAVs with cameras. - UAV Squad - These trucks have long-range UAVs that can patrol a hundred miles. - Engineer Squad - These combat engineers may perform mine sweeping, lay a few hasty mines to delay an advancing enemy, and destroy abandoned equipment. Their personnel have EOD and bridge capacity expertise. - Anti-armor squad - Five trucks with long range anti-armor missiles that can also down helicopters. Many armies send out a couple armored vehicles and even a tank for scouting. There are several systems available to fill this role, like this South Korean video-guided fiber optic missile. - Command Squad - This has the company command truck, but also a Gun truck with a 20mm gatling gun and three trucks with rocket launchers to provide instant hip-pocket artillery. 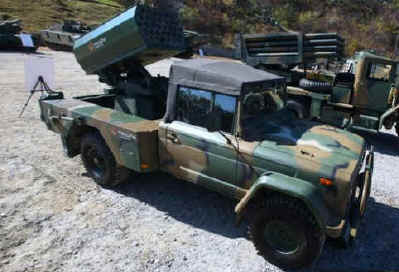 South Korea has a basic 70mm rocket launcher mounted on a light truck. (pictured) These are for emergencies where artillery or air support is not available to deal with an urgent situation. - Support Squad - These five trucks have winches to pull out stuck vehicles and are filled with repair supplies (mostly tires) and carry truck, small arms, and electronics repairmen. While major repairs are done at the battalion level or higher, these teams can make quick repairs to simple problems in the field. These supporting squads may seem redundant since support is available from their parent battalion, but scouts may operate up to a hundred miles away. Moreover, battalion elements use larger and slower trucks that must be requested via the battalion headquarters. Since scouts operate on chaotic battlefields, some organic support instantly deployable on fast light trucks is needed. The employment of a scout company will depend on mission and terrain. In static situations where their parent battalion is tied into adjacent units forming a continual front, scouts remain in the rear providing security, to include anti-aircraft support. As battalions move to make contact with an enemy, scouts lead the way and watch gaps that open between units to provide intel and prevent nasty surprises. They also detect and destroy enemy scout elements. In the offense, the lone point truck leads and slows or stops along the road if enemy forces are seen or suspected. Remotely controlled expendable trucks may be sent forward. The two soldiers remain inside since the enemy probably has them under observation trying to determine if the truck is friendly, hostile, or civilian. Engineers may be requested if mines are IEDs are suspected. Depending on the mission and nearby terrain, the other scout trucks quietly deploy to its flanks to observe or engage, which may include the four-man scout team advancing on foot. Once in place, a scout squad may choose to open fire or request additional firepower to come forward. In other cases, regular combat units following close behind move forward to engage the enemy. A scout squad may attack unless it is apparent that a sizeable enemy force is ahead. In those cases, the battalion headquarters is alerted and a plan is developed for regular combat forces. In most cases, the enemy is well concealed and his strength is not known until the scouts open fire and advance. If sizable enemy forces are encountered, the scouts back off as pre-planned artillery fires arrive on target. If scouts are pinned down due to heavy enemy fire, the company commander may employ his rocket trucks to pulverize the enemy for a few minutes to aid in their withdrawal. The scout engineers play an important role reporting bridge capacity, locating water crossings, and evaluating road problems (like mud, large craters, and washouts) so engineer units can be sent to repair roads or units can take different routes. Scouts also have a defensive role. An important and often neglected mission is stopping lost truck drivers, souvenir hunters, and curious officers who drive ahead of frontline forces and could be killed or captured. Advancing scouts may strike an enemy beehive, where hundreds of foot soldiers and several vehicles spring from the woods or a town and attack. Coordinating artillery fire at fast moving forces is difficult and regular forces may be distant or need time to respond. Scouts will conduct a rearguard action with quick ambushes, aided by the scout engineer squad that lays a few road mines and creates road obstacles with whatever is nearby. Future armies may resemble these scout companies by using simple platforms and deadly weaponry to slay today's big armored beasts. Recall the original Star Trek TV series where small phasers could vaporize objects. Weaponry is moving in this direction, where small weapons are so powerful that large multi-million dollar platforms can be destroyed by a foot soldier. Someone should develop a computer war game that pits six of the US Army's latest $4.6 million 17-ton 9ft tall Stryker IAVs armed a .50 cal. machine gun, against six $30,000 2-ton 5ft tall 20mm gatling gun trucks, or six truck mounted Soviet 23mm AAA guns (pictured in Libya below). The results would be extremely embarrassing to Army Generals. Soldiers firing open truck mounted weapons are vulnerable to artillery and gunfire. However, they are far less vulnerable to precision guided munitions. This is not only because their platforms are half the size, but direct hits may not even injure them as shape charges burn a small hole right through a truck below them. In contrast, those inside armored vehicles are often killed or severely injured by a small penetration that causes fragments (spall), overpressure concussions, and fires. In future wars, expendable trucks will be used to transport combatants with their deadly handheld weapons, who will often dismount to fight. Trucks will be lost often but simply replaced like a supply item since they cost less than handheld weaponry. 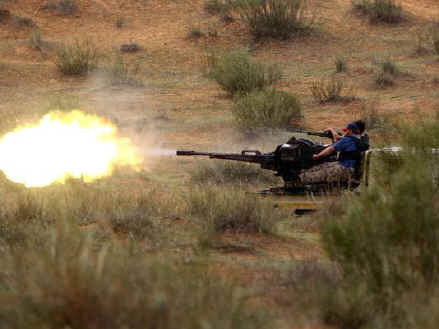 (A Javelin anti-tank missile costs $250,000!) Small trucks are also more difficult to hit at half the size with far less heat signature than big armored vehicles. Russia formed battalions like this in 2017. This reality will devastate politically powerful military contractors, who prefer to ignore this future. The day may soon arrive when tanks, APCs, and large attack helicopters are obsolete against a modern army. Since video guided missiles and UAVs with warheads can strike from any direction, that day may have already arrived. "Way back in October the Russian paper Izvestiya reported that the Russian military was setting up units built around technicals — light, pick-up trucks, with heavy weapons mounted in the back. Supposedly the experience gained in participating in the war in Syria against ISIS had shown the army such a unit could be extremely useful."